Abair stoirm! Dh’fhàg mi Dùn Èideann còmhla ri ceathrar luchd-ealain eile agus triùir luchd-obrach Imaginate gus tadhal air Fèis Export/Import aig Bronks. ’S e taigh-cluiche Duitsis Bhruiseil do dhaoine òga a th’ ann am Bronks, agus tha measgachadh de riochdachaidhean, companaidhean a’ tadhal agus pàirt foghlaim aige gus freagairt air caochlaideachd de luchd-èisteachd. Tha an obair aca a’ dèiligeadh ri cuspairean buntainneach agus connspaideach a tha tarraingeach do dhaoine òga. Bidh fàilte ro luchd-ealain ùra agus stèidhichte do na riochdachaidhean. Tha cultar na fèise socair ach cuideachd connspaideach agus dùbhlanach. ’S e taigh-cluiche a th’ ann a tha airson dol an sàs leis an t-saoghal agus a bheir seachad dòigh gus a thuigsinn nas fheàrr. ’S e ceangal eadar cultaran, fèin-aitheantan, cànanan agus diofar sheòrsaichean de dh’ealan a th’ ann am Bronks. Chunnaic sinn 16 taisbeanaidhean ann an trì làithean. B’ e sin an dàrna turas a chunnaic mi uimhir sin de dh’obair ann an ùine cho goirid. [B’ e a’ chiad turas aig Fèis Imaginate san Ògmhios 2018, far am faca mi Spontaneous, Paper Memories, Stick by Me, Gretal and Hansel, Expedition Peter Pan, Baby Yaga, A Feast of Bones, We come from Far Far Away, Mbuzeni.] Bha an smiodam gus coimhead air obair san dòigh sin ùr dhomh, dìreach mar a bha an comas a bhith a’ cumail sùil gheur agus inntinn fhosgailte anns gach taisbeanadh. Bha na dealbhan-cluiche aig Fèis Bronks gam leasachadh gu bunasach mar chuideigin a nì dealbhan-cluiche a chionn ’s gun robh ìre na h-obrach do dhaoine òga cho sònraichte àrd is gum bithte a’ strì àireamh is ìre cho àrd a chumail san dùthaich seo. Dh’ionnsaich mi an t-uabhas bho bhith a’ coimhead air na h-amasan aig gach pìos obrach, na sgilean teicnigeach gus dealbh-cluiche a dhèanamh sa Bheilg, nach robh ann an dòigh sam bith air a thanachadh do dhaoine òga agus a rinn soilleir cho àrd is a tha spèis an luchd-ealain don èisteachd òg aca. Cha b’ e a-mhàin ìre nan taisbeanaidhean a rinn a’ chuairt seo luachmhor don mhuinntireas agam ach gun robh mi a’ coimhead air an obair còmhla ri luchd-ealain eile, a’ còmhradh gu neo-fhoirmeil leotha. Chuidich sin dhomh an obair fhaicinn ann an tòrr diofar dhòighean agus bha sin deatamach dhomh gus an obair agam fhèin a leudachadh aig deireadh a’ mhuinntireis agam. A bharrachd air sin bha an t-eòlas agus an cùram a sheall Imaginate dhan luchd-ealain aca air leth. Bha cothrom againn an obair a dheasbad tro an sùilean-san agus b’ urrainn dhuinn dàimhean deatamach a thogail leis na daoine a chuireas taic ris na tùrnan cruthachail againn. What a whirlwind! 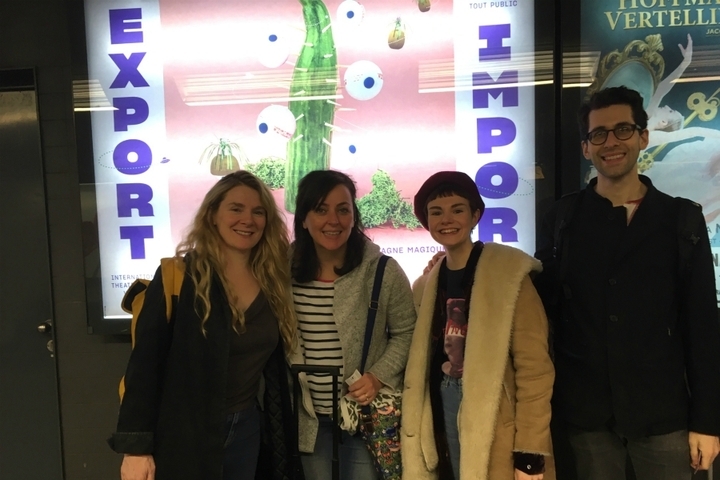 I left Edinburgh with four other artists and three members of the Imaginate staff to go to the Export/Import Festival at Bronks. Bronks is Brussels’ Flemish-language theatre for young audiences, which has a combination of productions, invited visiting companies and an educational strand to suit a variety of audiences. The work deals with relevant and provocative topics in a way that appeals to a young audience. Both emerging and established names are invited to do productions. The culture of the festival is relaxing, but also provocative and demanding. It is theatre that aims to engage with the world and provides a means by which to understand it better. Bronx is a crossroads of cultures, identities, languages and art forms. We saw 16 shows in three days. This was the second time that I had seen work in such a volume over a concentrated period of time. [The first time was at Edinburgh International Children's Festival in June 2018 – where I saw: Spontaneous, Paper Memories, Stick by Me, Gretal and Hansel, Expedition Peter Pan, Baby Yaga, A Feast of Bones, We come from Far Far Away, Mbuzeni]. The stamina required to view work in this way was a new discipline for me in itself, as was the ability to keep a critical eye and an open mind for each show. The performances in the Bronks Festival were life changing as a theatre maker because the quality of work for young people was of a level that you’d struggle to maintain within the shows available for adults in this country. I learnt so much from watching the ambitions of each piece of work, the technical prowess of making theatre in Belgium, which in no way was watered-down for young people and made clear, the respect the theatre makers have for their young audiences. What made this experience crucial to my residency wasn’t only the quality of the work, it was the fact that I was seeing the work with other artists, having informal conversations with them that help me see the work in lots of different ways and it central in forming ideas for my own sharing of work at the end of the residency. This was all underpinned by the experience and care Imaginate have with their artists – we were able discuss the work through the eyes of their experience as well as form crucial relationships with the people who support our creative endeavours.